RINGO project appeared in the September issue of the European Aeronautics Science Network (EASN) newsletter. The project is featured in the section covering the latest news from Coordination and Support Actions. The news dedicated to RINGO reminds of its participation in the 7th EASN International Conference on “Innovation in European Aeronautics Research”, to be held in Warsaw (Poland) next week. 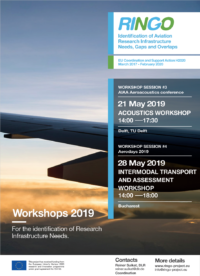 It also highlights that RINGO will organize a parallel session under the umbrella of session 12, dedicated to European Research Programs & Initiatives, focusing on aviation research infrastructures. This project has received funding from the European Union's Horizon 2020 research and innovation programme under grant agreement No 724102.